By 1969, twenty-four year old Belgian chanteuse Claude Lombard had been involved in the music industry for seven years, and had already written several scores and appeared as a session singer on numerous singles. Claude Lombard had also represented Belgium at Eurovision Song Contest and released a number of singles during the rises and rise of yé-yé music. Somehow, Claude Lombard still found time to study for a degree and postgraduate degree. The twenty-four year old had achieved a lot in a relatively short space of time. There was however, one thing she had still to do,…release an album. That changed when she released Chante, which was an album of groundbreaking chanson psychedelia. 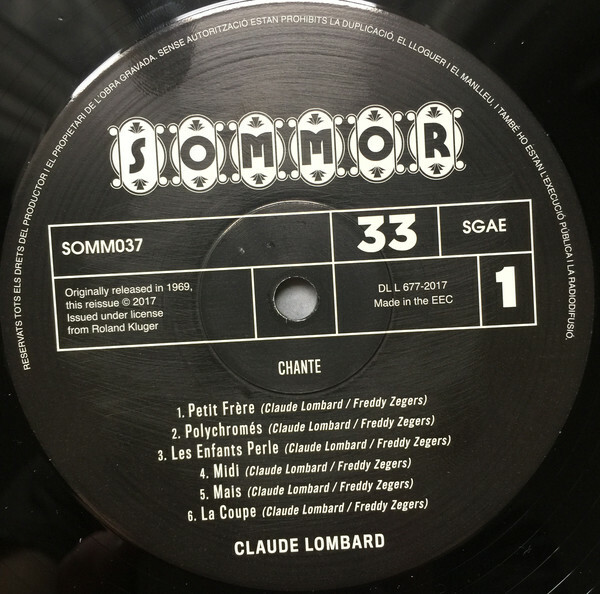 Chante which was recently released by Sommor Records, an imprint of Guerssen Records, was the latest chapter in the Claude Lombard story. Claude Lombard was born in Brussels in 1945, and brought up in a musical family. Her mother was actress Claude Alix, who later went on to sing rock ’n’ roll as Rita Roque, while Claude Lombard’s father was a jazz pianist and singer. He introduced his daughter to music at an early, and Claude Lombard caught the music bug. By the time Claude Lombard was a teenager, she was taking music lessons. She studied the guitar, music, harmony, counterpoint and composition. This would stand Claude Lombard in good stead for the future. However, as she prepared to leave high school, Claude Lombard was unsure what the future held for. As a result, Claude Lombard decided to study law at university. It looked as if Claude Lombard was about to turn her back on music. That wasn’t the case. When she arrived at university, Claude Lombard decided enrol in some dramatic arts courses. However, it wasn’t long before Claude Lombard decided to change direction academically. Law wasn’t for Claude Lombard. Instead, Claude Lombard decided to enrol at the Superior Institute of Arts and Choreography (ISAC). It soon became apparent that this was Claude Lombard had found her calling. She immersed herself in the new course and studied all aspects of music, dance and theatre. Some of the classes would prove useful when Claude Lombard embarked upon a musical career. Especially the classes in interpretation and the music lessons that Claude Lombard took. By the time she left ISAC, she had honed her skills as a pianist and guitarist. This would stand her in good stead when she graduated from ISAC. Having left ISAC, one of Claude Lombard’s first jobs was writing the score to the musical adaptation of Boris Vian’s The Foam Of The Daze. Not long after that, she joined forces with her mother and wrote the score to Flower Power. Meanwhile, Claude Lombard was working as a session singer, and featured on countless singles and the occasional album. Claude Lombard’s career had taken off. 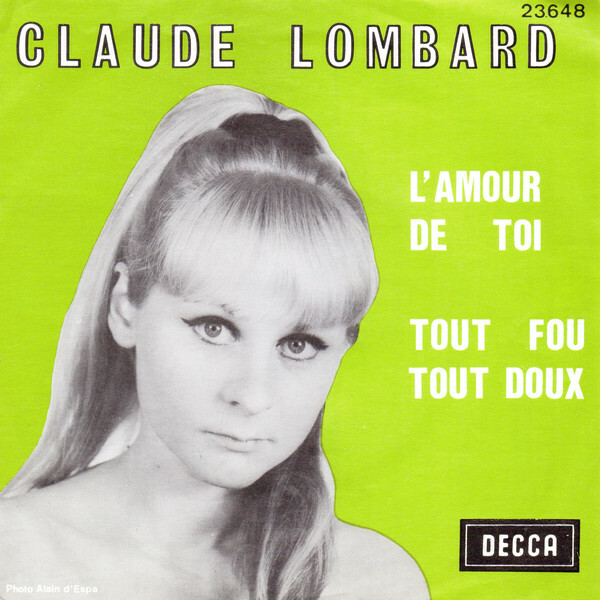 Still, Claude Lombard found time to write and record her debut single L’Amour De Toi, which was released by Decca in 1965. By then, yé-yé music had swept much of mainland Europe and was hugely popular. Claude Lombard was keen to add yé-yé singer to her burgeoning CV. By then, Claude Lombard was spending much of her time writing and recording. Although she was constantly busy, Claude Lombard was determined to improve herself musically. She had an insatiable thirst for knowledge and self-improvement, and decided to enrol on a doctorate course. Despite returning to the world of academia, Claude Lombard continued to embark on new musical challenges. She became part of the contemporary music group Music Nouvelles and the Jazz Orchestra of Belgian Radio Television. This resulted in Claude Lombard meeting Peter Bartholome, who was one of the leading lights of Belgian music. He offered Claude Lombard a role in the Luciano Berio’s opera Laborintus, which was being staged at the Theatre Royal in Brussels. At first, Claude Lombard was unsure about accepting the role as she still unsure about her talent and ability. Eventually, she accepted the role and Claude Lombard’s role in Laborintus received praise and plaudits. This helped Claude Lombard’s confidence. After her appearance in Laborintus, Claude Lombard was due to make an appearance at the Festival Mundial de la Cancion Latina. The competition was fierce, with forty participants vying for this prestigious prize. Claude Lombard sung Petit Frère, which featured lyrics by Freddy Zegers. While Claude Lombard finishes in a respectable tenth place, Freddy Zegers won the gold medal for his lyrics to Petit Frère, which later opened Chante. After returning from the Festival Mundial de la Cancion Latina, Claude Lombard and Freddy Zegers formed a formidable songwriting partnership. Claude Lombard and Freddy Zegers also released the Profond EP Palette in October 1967. Alas, the EP failed to find an audience and it was back to the drawing board for Claude Lombard. 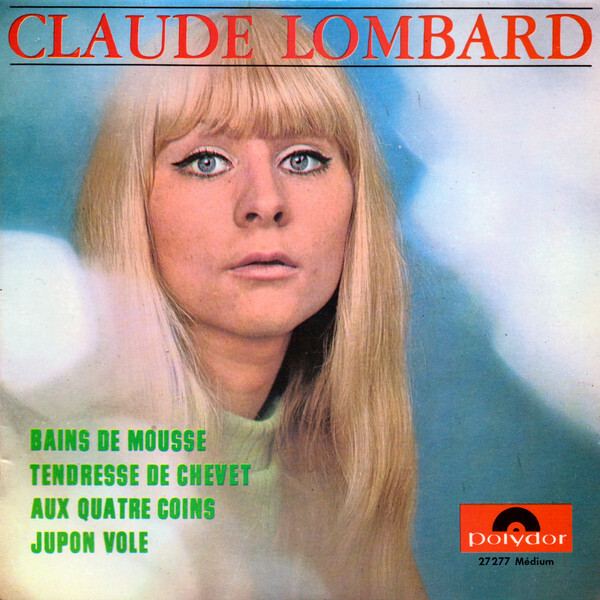 Later in 1967, Claude Lombard released a solo EP which featured four of her own compositions. Stylistically, Bains De Mousse, Tendresse De Chevet, Aux Quatre Coins and Jupon Vole were all very different and ranged from bossanova to chanson and pop. Alas, when the EP was released on Polydor it also failed to find an audience. However, Claude Lombard wasn’t about to give up. Her persistence paid off when Claude Lombard was chosen to represent Belgium at the 1968 Eurovision Song Contest, which was being held at the Royal Albert Hall, in London, England. That night, Claude Lombard sang Quand Tu Reviendras and finished in a very respectable seventh place. 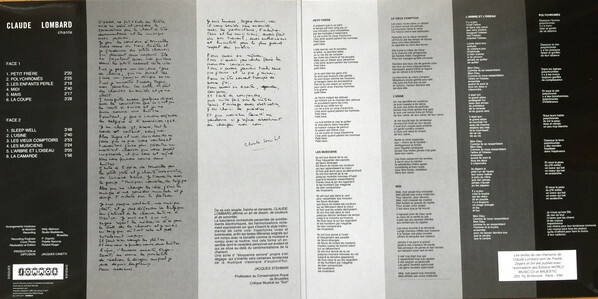 Quand Tu Reviendras was released as a single by Palette in April 1968. On the B-Side was Claude Lombard and Freddy Zegers composition Les Petits Couteaux. It found Claude Lombard and Freddy Zegers reunited as they duetted once again. 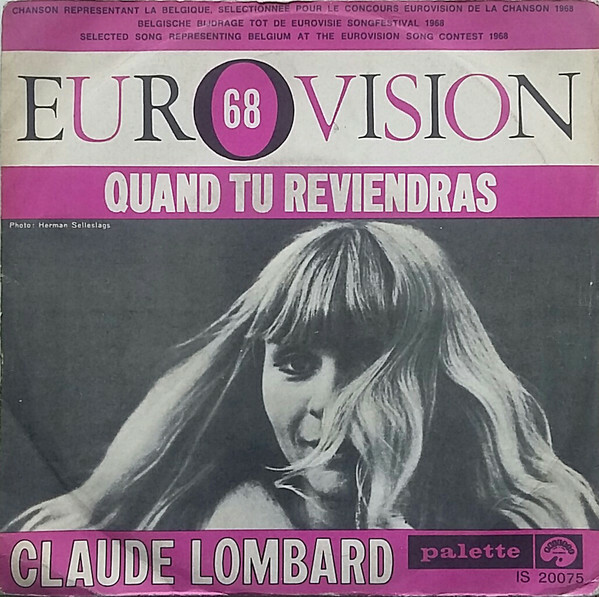 Despite the relative success of Quand Tu Reviendras at the Eurovision Song Contest, widespread commercial success continued to elude Claude Lombard. Despite her lack of success in Belgium, Claude Lombard’s singles were released all over Europe, including in France, Germany, the Netherlands and Spain. Yé-yé music was still popular across mainland Europe, and Claude Lombard was marketed as a yé-yé singer. This would change when Claude Lombard released her debut album Chante in 1969. For her debut album Chante, the Claude Lombard wrote the music to eleven new songs while Freddy Zegers penned the lyrics. They joined Petit Frere, which Claude Lombard had sung at the Festival Mundial de la Cancion Latina just a few years previously. It made a welcome return on Chante, which was recorded at Studio Madeleine, in Brussels, with producer Roland Kluger. With Chante complete, all that was left was to release Claude Lombard’s debut album. The label that Claude Lombard chose to release Chante, was Disques Jacques Canetti. When it was founded in 1962, by Jacques Canetti, it became the first ever French independent record label. Disques Jacques Canetti released Chante in 1969, but sadly, it failed to find the audience it so richly deserved. This was a great shame, as Chante was an album of beautiful, groundbreaking and influential album of chanson psychedelia that sometimes, headed in the direction of avant-garde and sci-fi pop. Sadly, Chante was way ahead of its time and record buyers neither understood nor grasped the importance of this future cult classic. Straight away, drums pound and power the arrangement to Polychromés along. Meanwhile, horns bray as Claude delivers a brisk and urgent vocal. Adding to the urgency is the drums, while futuristic keyboards add a lysergic sound to this genre-melting, cinematic track. Already, elements of avant-garde, experimental, jazz, pop, and psychedelia are being combined by Claude and her band. They create an ambitious, dreamy, hypnotic and lysergic backdrop that dance along, and sets the scene for Claude’s urgent and sometimes, ethereal vocal. Chimes and bells ring as Les Enfants Perle unfolds. Soon, the rhythm section and brisk guitar join shimmering, glistening keyboards and otherworldly, futuristic sounds. They provide an accompaniment to Claude Lombard’s tender, heartfelt vocal. Later, the chimes and bells flit in and out, playing their part in this beautiful, dreamy reminder of the Queen of chanson psychedelia at her best. Stabs of piano quicken, creating an urgent backdrop on Midi. It’s joined by the bass, before the rest of the band join the frae. They create a backdrop the flits seamlessly between jazz, soul jazz and incorporates psychedelia. Meanwhile, Claude’s vocal veers between urgent, sultry, soulful and when the arrangement becomes understated, tender and lysergic. Especially, when reverb is added to her vocal. Adding to the psychedelic backdrop is washes of Hammond organ, before the arrangement takes on jazzy cinematic sound. Claude embraces this new sound, before the tempo rises and she joins her band, who power this cinematic song along until it reaches a memorable crescendo. It’s all change on Mais, where a piano sets the scene for Claude on this jazz-tinged song. The twenty-four year old chanteuse delivers one of her most tender, heartfelt vocals and shows maturity beyond her years. It’s as if the band realise that this one of Claude’s finest moments and take care not to overpower her vocal. Instead, an organ and joins the piano, which plays a leading role in the sound and success of the song. It features one of the finest vocals on Chante from chanteuse Claude Lombard who delivers expressive vocal as she breathe meaning and emotion into the lyrics. As La Coupe starts to reveal its secrets sci-fi sounds combine with the rhythm section, piano and guitar. Claude delivers a slow, thoughtful and tender vocal. Sometimes, her vocal soars above the arrangement as it skips along, with a piano combining with the rhythm section and guitar. They’re joined by shimmering keyboards and futuristic, otherworldly sounds. This is the final piece of the jigsaw. Later, effects transform Claude’s vocal, which becomes ghostly as she scats during this genre-melting, cinematic, chanson psychedelic opus. A clock chimes as Claude singe “Sleep Well” tenderly. Meanwhile, chanson psychedelic sound starts to unfold. Sci-fi sounds combine with the rhythm section and guitar. who play slowly and deliberately. Meanwhile Claude’s vocal rises and falls, cascading across the arrangement during what sounds like a modern lullaby. That is apart from when sci-fi sounds are added and briefly, effects are added to Claude’s vocal. They add a twist to this modern lullaby before it reaches a crescendo. By then, Sleep Well sounds as if it belongs in a short gothic film. A shrill sound drones briefly, before giving way to a funky guitar, rhythm section and tough keyboards that combine on L’Usine to create an urgent backdrop for Claude. Her vocal is equally urgent, but also powerful, ethereal and impassioned. Meanwhile, otherworldly and futuristic sound are added. Later, they become more prominent and create a cinematic backdrop for Claude’s vocal. Adding to the cinematic sound is Claude’s effect-laden vocal which soars high above the arrangement. Latterly, otherworldly sounds dominate the arrangement adding to the cinematic sounds on a track that fuses drama with avant-garde, experimental, funk, Musique Concrète and chanson psychedelia. Lush strings sweep and combine with flourishes of piano on Les Vieux Comptoirs. Soon, washes of a swirling Hammond organ and guitar combine as Claude delivers one of her most tender and elegiac vocals. It sits atop the arrangement as it flows along constantly tugging at one’s heartstrings. By the end of this beautiful, orchestrated track it’s apparent that this is chanteuse Claude Lombard’s finest moment on Chante. Drums pound ominously on Les Musiciens, and join stabs of piano and otherworldly sounds that provide the backdrop for Claude’s heartfelt vocal. They’re joined by a funky guitar and swirling Hammond organ. Soon, Eastern, experimental and lysergic sounds are added to this musical tapestry, as Claude delivers her vocal with urgency and emotion. It soars high above the arrangement, with sci-fi sounds and rat-a-tat drums providing a contrast to the funky guitar and the dusty swirling Hammond organ. They accompany Claude as she continues to combine drama, emotion and urgency during this poignant and truly memorable song. From the opening bars, L’Arbre et L’Oiseau has an unmistakable sixties sound. That is the case from the moment the song bursts into life, with Claude’s band playing as one. The rhythm section and funky guitar combine with the Hammond organ as Claude grabs the song by the scruff of the neck and makes it her own. She combines power and emotion, while her band combine funk, with pop, psychedelia and rock. With just over thirty-seconds left, Claude passes the baton to her multitalented band, who ensure this irresistible song ends on a high. La Camarde, which closes Chante, is akin to a journey on an old steam train. Drums replicate the sound a steam train makes as it heads across the tracks. Meanwhile, a whistle blows, Hammond swirls and the bass marches the arrangement along and is later, joined by a piano. Adding the finishing touch is Claude’s vocal, which veers between tender to ethereal, dramatic and sultry. 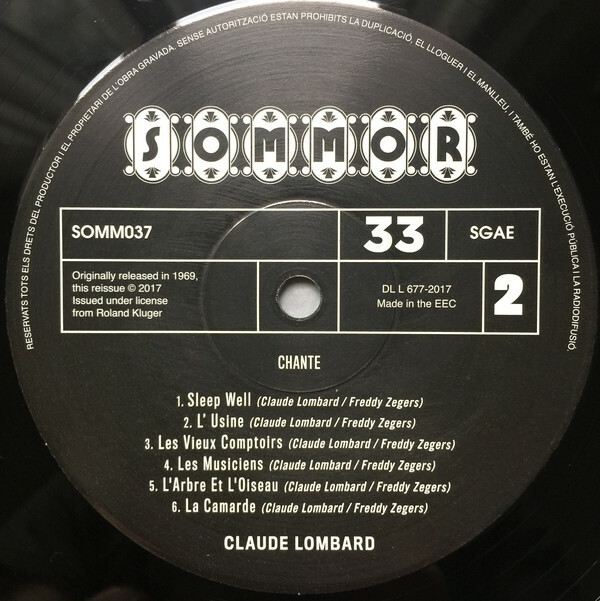 While Claude’s vocal plays a leading role during this last part of the musical journey, her talented and versatile band play their part in the sound and success of La Camarde. There’s an element of theatre to this melodic and memorable song that closes Belgian chanteuse Claude Lombard’s debut album Chante. Seven years after she embarked upon a musical career, Claude Lombard finally got found to recording her debut album Chante. By then, Claude Lombard sung opera, appeared at the Eurovision Song Contest in 1968 and had even been a yé-yé singer. When Claude Lombard released Chante in 1969, it was important, innovative and influential album of. That was despite Chante failing to find an audience upon its release in 1969. Back then, people failed to understand an album that was way ahead of the musical curve. While Chante was ostensibly an album of chanson psychedelia and sci-fi pop, there’s much more to this genre-melting album. 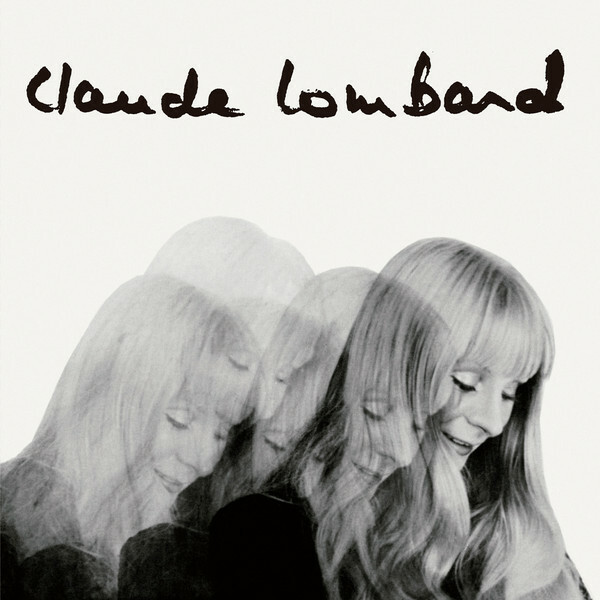 It finds Claude Lombard fusing and flitting between avant-garde, chanson electronica, experimental, funk, Musique Concrète, pop, psychedelia and rock. The result was an album of music that was variously beautiful, dramatic, dreamy, lysergic, melancholy, orchestral and wistful. Sometimes, the addition of futuristic and sci-fi sounds transformed the music, and it became otherworldly and cinematic. Given this cinematic sound, it’s as if Claude Lombard’s carefully sculpted songs were meant to be part of the soundtrack to a short films. These songs were also very different from much of music being released in Belgium in 1969. Twenty-four year old chanteuse Claude Lombard pioneered the chanson psychedelia and sci-fi pop on Chante 1969. Somewhat belatedly Chante found the audience it so richly deserved and went on to influence and inspire several generations of musicians. Especially, it seems, groups like Broadcast and Stereolab. Their music has obviously been influenced and inspired by Chante which nowadays, is regarded as a cult classic. Sadly, copies of Chante were almost impossible to find, unless record collectors were willing to spend upwards of £250. Fortunately, Chante was recently reissued on CD and LP by Sommor Records, an imprint of Guerssen Records. The recent reissue of Chante by Sommor Records is the perfect opportunity to discover or rediscover the delights of a truly groundbreaking album. 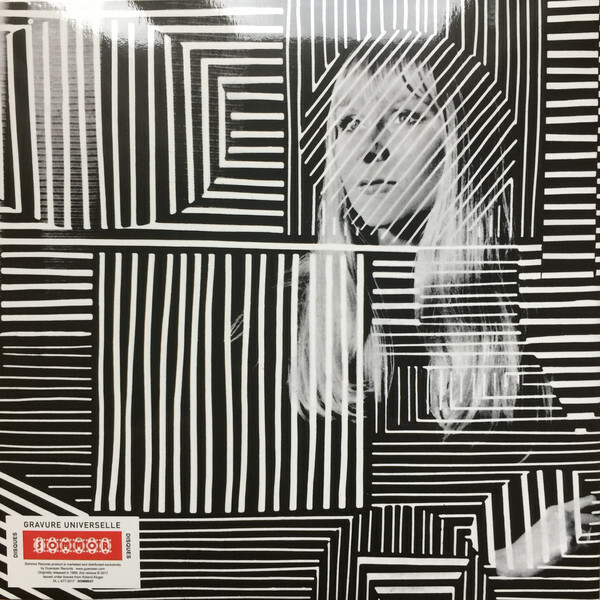 It features twenty-four year old Belgian chanteuse Claude Lombard, who pioneered chanson psychedelia and sci-fi pop on her 1969 debut album Chante, which went on to influence and inspire several generations of musicians, and will continue to do so. ← MAD MATS DIGGING BEYOND THE CRATES VOLUME 1. I’ve just received a copy from ‘That Special Record’ but haven’t had a chance to listen yet. I had no idea about what it was so this post is really handy, thank you. few months. I’ll be interested to hear how you enjoyed the albums. Records clubs like That Special Record seem to be becoming popular. I’m pleased that they chose Claude Lombard’s Chante for their album of the month. As you’re about to discover, it’s a very special album. I hope that you enjoy it.